[email protected]: Great meetings and dinner tonight in Vietnam with Kim Jong Un of North Korea. Very good dialogue. Resuming tomorrow. 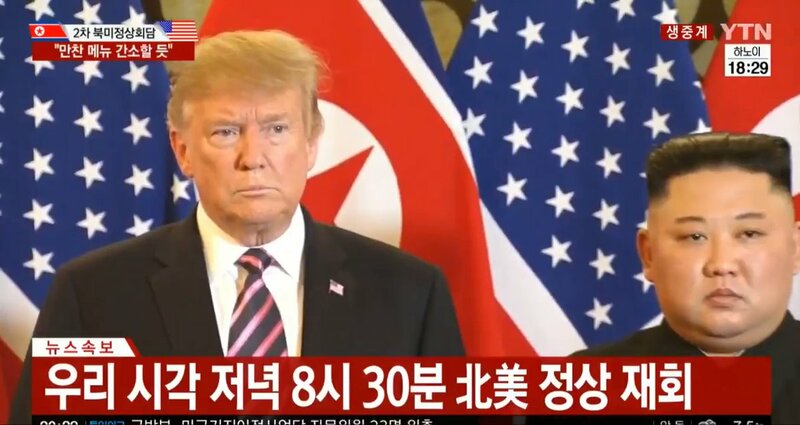 Hanoi summit dinner meeting ran under 3 hours. 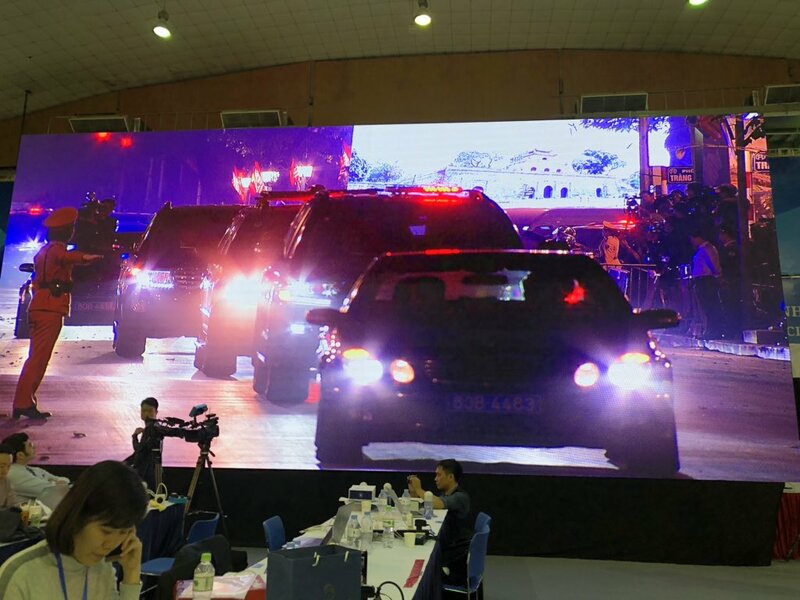 Kim Jong Un motorcade seen departing and returning to his hotel. Kim Jong Un and President meet for the second time in a high-stakes summit in Hanoi. 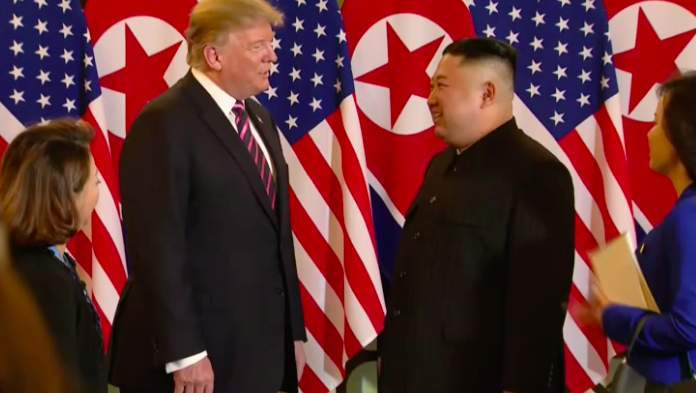 Trump said he believes this summit will be a "success"
The two head into what is a scheduled 20-minute one-on-one chat. Kim Jong Un arrives at the Metropole - with security - for private Trump dinner and talks. 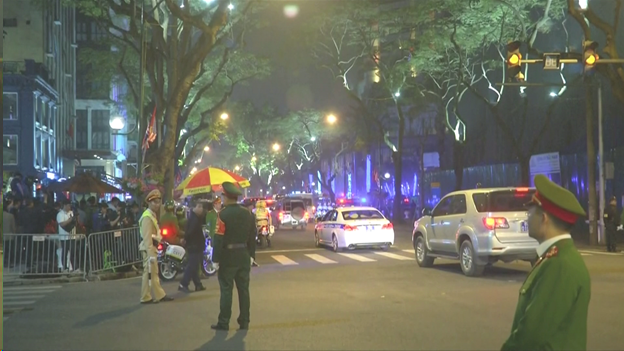 Pres Trump's motorcade arrives at Metropole Hotel in Hanoi for talks and dinner with Kim Jong Un. [email protected]: All false reporting (guessing) on my intentions with respect to North Korea. 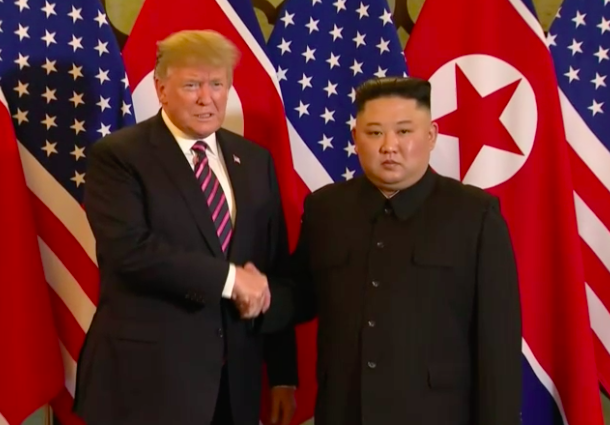 Kim Jong Un and I will try very hard to work something out on Denuclearization and then making North Korea an Economic Powerhouse. I believe that China, Russia, Japan and South Korea will be very helpful. North Korean embassy in Madrid was assaulted last Friday. Embassy workers were taken hostage during 4 hours, computers stolen. 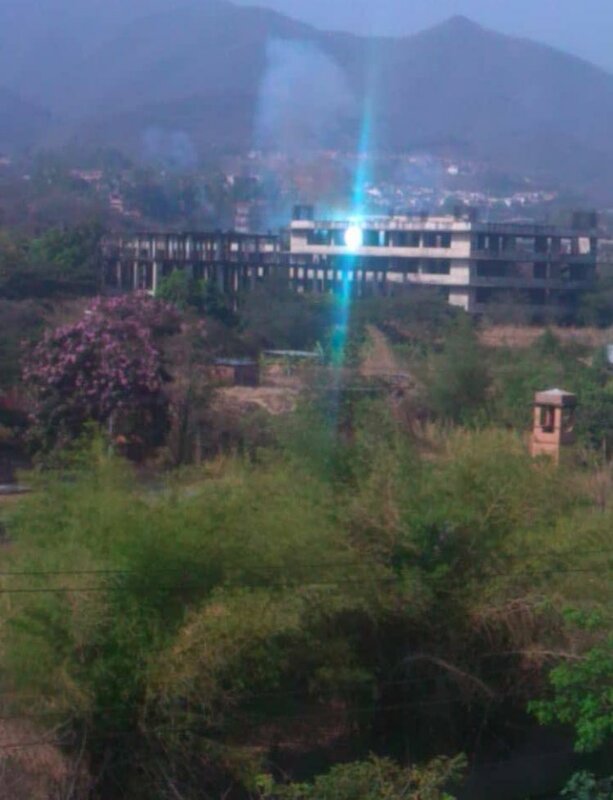 Attackers escaped. KCNA: "Japan left scars in the hearts of the Asian people by committing hideous inhumane crimes against them. Such wound is hard to be healed and will remain generation after generation." KCNA: "Japan, which has neither admitted nor atoned for its past crimes, is going so shameless as to seek the status of a permanent member state of the UNSC whose mission is to preserve global peace and security. This is just an openchallenge to human conscience." [email protected]: Vietnam is thriving like few places on earth. North Korea would be the same, and very quickly, if it would denuclearize. The potential is AWESOME, a great opportunity, like almost none other in history, for my friend Kim Jong Un. We will know fairly soon - Very Interesting. KCNA: "At Melia Hotel, Supreme Leader Kim Jong Un listened to the detailed report on the contact between the working delegations dispatched by the DPRK and the U.S. to Hanoi for the successful second DPRK-U.S. summit talks." KCNA: "Kim Jong Un, chairman of the Workers' Party of Korea and chairman of the State Affairs Commission of the Democratic People's Republic of Korea, received a report on the activities of the working delegation to the second DPRK-U.S. summit talks after arriving in Hanoi." KCNA: "He also learnt in detail about the life of members of the embassy and their families. He gave them a warm pep talk wishing them well with their work in good health in the future, too and had a photo session with them." KCNA: "Kim Jong Un, chairman of the Workers' Party of Korea (WPK) and chairman of the State Affairs Commission of the Democratic People's Republic of Korea, visited the DPRK embassy in Hanoi on Tuesday afternoon. Kim Jong Un learnt about the work and situation of the embassy." KCNA: "The Supreme Leader will meet with Donald J. Trump, president of the United States of America, to have the historic second DPRK-U.S. summit on Feb. 27 and 28 and will pay an official goodwill visit to the Socialist Republic of Vietnam on March 1 and 2." 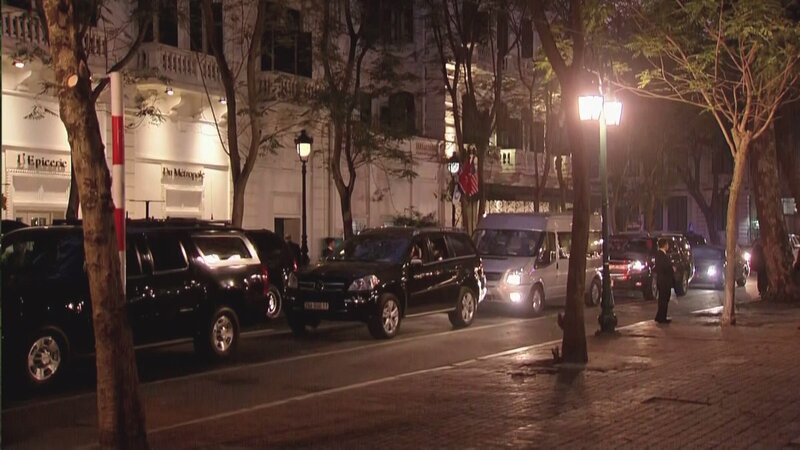 KCNA: "Acknowledging the enthusiastically cheering masses, he got into his private car and headed for his lodging place Melia Hotel. Along the hundreds of miles-long routewere numberless Vietnamese people of various strata, who wavedbouquets to warmly welcome Kim Jong Un." KCNA: "The train carrying the Supreme Leader arrived at Dong Dang Station in the border area of Vietnamafter passing through several provinces and cities of the People's Republic of ChinaA Vietnamese woman presented him with a bouquet in welcome of his visit to Vietnam." 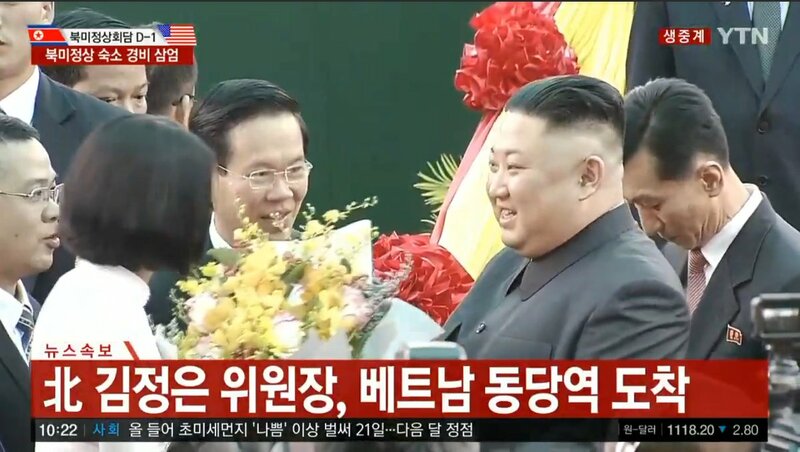 KCNA: "Kim Jong Un, chairman of the Workers' Party of Korea and chairman of the State Affairs Commission of the Democratic People's Republic of Korea, arrived in Hanoi, the Socialist Republic of Vietnam on Tuesday." KCNA: "The ardent yearning and blood ties between the leader and the people are just the blood vessel of our single-minded unity and source of inexhaustible powerin which Supreme Leader Kim Jong Un and the people are linked with blood tiesfor effecting revolutionary upsurge." KCNA: "It is thecustom of Juche Korea that the leader trusts its people and boundlessly loves them while the latter repose an absolute trust in and remain faithful to the formerThe leader always gives top priority to the people and the people devotedly uphold the leader." 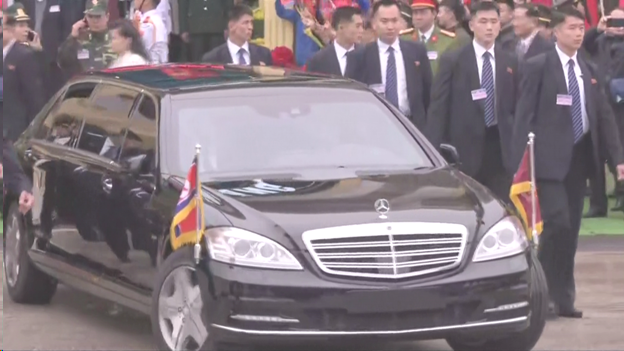 Kim Jong Un could be seen waving from inside a Mercedes stretch limo pulling away from the railway station, for the 100 mile drive to Hanoi. 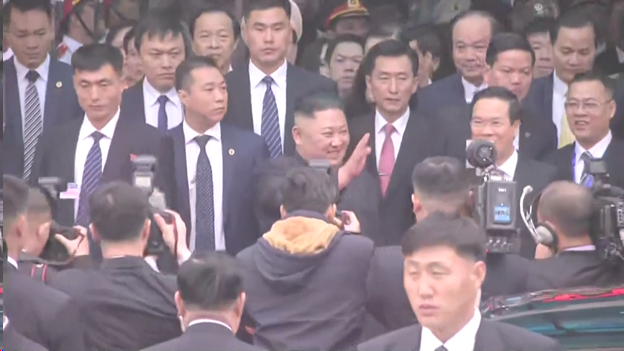 Surrounded by security personnel, North Korea's Kim Jong Un arrives in Vietnam for summit with Pres Trump. His green armored train pulled into Dong Dang railway station just over the Chinese border in Vietnam. North Korean leader Kim Jong Un has arrived in Vietnam after a train journey of nearly 3 days; he will continue to Hanoi by car. 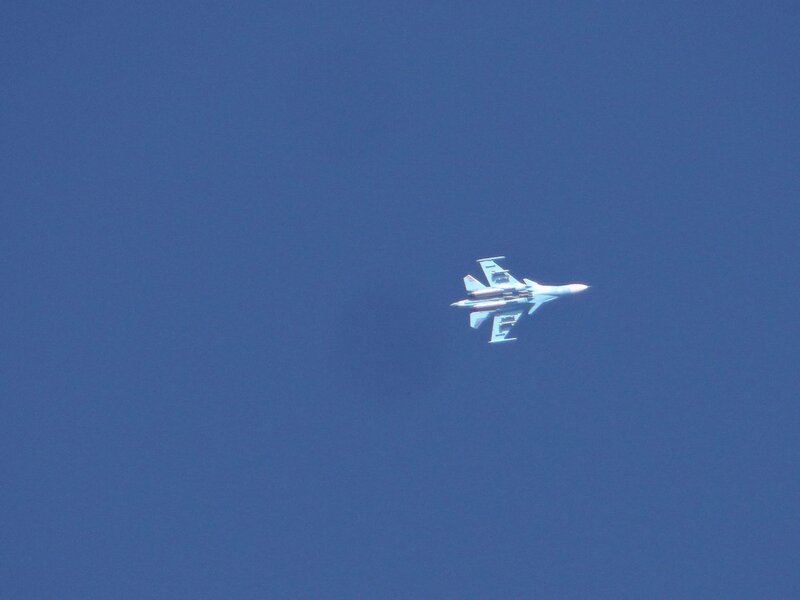 Японское правительство запустило всенародную трансляцию, с помощью которой информируют население о том, как защитить себя в случае ракетной атаки Северной Кореи.